Schwarzenegger's Weekend gets Ruined in the Red-Band Trailer for Kim Jee-Woon's 'THE LAST STAND'! The Red Band trailer for Kim Jee-Woon's The Last Stand has been released & you can check it out after the jump. The movie arrives this January 18th & stars Arnold Schwarzenegger, Johnny Knoxville, Rodrigo Santoro, Forest Whitaker, Peter Stormare, Eduardo Noriega, Zach Gilford & Jaimie Alexander. Schwarzenegger plays Ray Owens a small-town sheriff who becomes the last guy standing between a ruthless cartel leader [Noriega] & the Mexican border. Hit the jump for the details. Synopsis: "After leaving his LAPD narcotics post following a bungled operation that left him wracked with remorse and regret, Sheriff Ray Owens (Schwarzenegger) moved out of Los Angeles and settled into a life fighting what little crime takes place in sleepy border town Sommerton Junction. But that peaceful existence is shattered when Gabriel Cortez (Eduardo Noriega), the most notorious, wanted drug kingpin in the western hemisphere, makes a deadly yet spectacular escape from an FBI prisoner convoy. With the help of a fierce band of lawless mercenaries led by the icy Burrell (Peter Stormare), Cortez begins racing towards the US-Mexico border at 250 mph in a specially-outfitted Corvette ZR1 with a hostage in tow. Cortez’ path: straight through Summerton Junction, where the whole of the U.S. law enforcement, including Agent John Bannister (Forest Whitaker) will have their final opportunity to intercept him before the violent fugitive slips across the border forever. At first reluctant to become involved, and then counted out because of the perceived ineptitude of his small town force, Owens ultimately rallies his team and takes the matter into his own hands, setting the stage for a classic showdown." 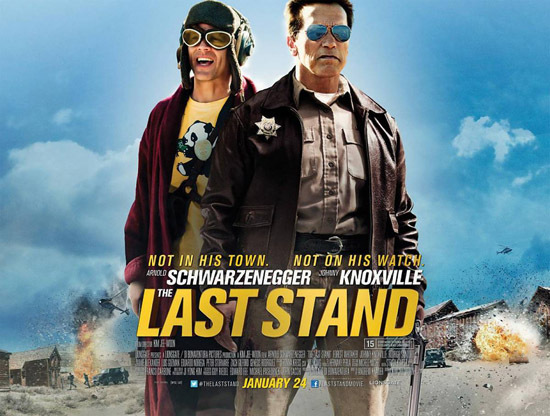 I'm reading: Schwarzenegger's Weekend gets Ruined in the Red-Band Trailer for Kim Jee-Woon's 'THE LAST STAND'!Tweet this!